(RFE/RL) January 12, 2007 (RFE/RL) -- EU ministers are asking the same questions they asked in January 2006 when Russia halted supplies of gas to Ukraine: Is Russia a reliable fuel supplier, or is it using energy as a weapon to reestablish hegemony over the former Soviet space? But the question that is not being asked is why Russia's crude-oil customers within the EU find themselves so heavily reliant on the Druzhba pipeline. Have no alternative routes been considered in the past, and if there were, why were they rejected? A case can be made that Russian skullduggery, combined with European miscalculations and inactivity, set the stage for recent events. This is best illustrated by the case of the Odesa-Brody pipeline in Ukraine. Ukraine built the 674-kilometer Odesa-Brody pipeline in the hope of competing with other routes for the lucrative job of moving Caspian oil to the West. Azerbaijani and Kazakh crude oil, a high-quality blend, needed to avoid being transported by Russian pipelines where it could mix with the sour Urals blend. Constructing the Odesa-Brody route, which runs from the Black Sea to the Polish border, was seen as the ideal solution. The pipeline's first phase was put into operation in May 2002. It boasted a throughput capacity of 9 million tons with the capability to reach 14.5 million tons yearly. This pipeline was intended to transport Caspian oil from the newly built Pivdenny terminal to the existing Druzhba pipeline for transport to European refineries. From there it would be sold to distributors in Europe and elsewhere. Both projects came under the direct jurisdiction of the Ukrainian state-owned oil and gas monopoly, Naftohaz Ukrayiny, and its subsidiary company, UkrTransNafta, the manager of oil pipelines in Ukraine. As these projects were under construction, "Alexander's Oil And Gas" on June 9, 2000, reported that U.S. Energy Secretary Bill Richardson said the U.S. government supported Ukraine's plans to build the new Pivdenny oil terminal and the Odesa-Brody oil pipeline. Richardson added that the new terminal would help Ukraine diversify its energy sources and thus make the country less dependant on Russia. The Ukrainian side was encouraged by the European Union and the United States to build the Odesa-Brody pipeline. However, after it was completed, Ukraine did not have the money required to fill it with Caspian crude and none of the European states were willing to build the connecting pipelines needed to link Odesa-Brody to refineries. As "Stratfor Commentary" noted on September 8, 2003, "The end result was that Kiev found itself saddled with a white elephant rusting picturesquely in the Ukrainian countryside." But serious doubts were also expressed as to the direction oil in the Odesa-Brody would take. Matthew Sagers of Cambridge Energy Research Association was quoted by Interfax on August 15, 2003, as saying that there was no demand for Caspian oil in Northern Europe due to its high price and that there would be no problems if the pipeline were to transport oil south, to the Pivdenny terminal and then via the Bosporus. Sagers claimed that an additional 9 million tons of oil per year would not overburden the heavily trafficked straits. At this time the Russian-British firm TNK-BP began a massive lobbying campaign in Kyiv to reverse the flow of the Odesa-Brody -- sending its oil south to the Black Sea. Despite a decision by Ukraine's Cabinet of Ministers to send oil in the northerly direction, Ukrainian President Leonid Kuchma suddenly began agreeing that Russian oil should be put into the pipeline and pumped south. 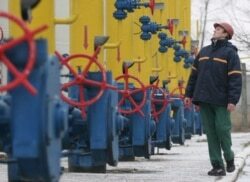 On April 29, 2003, the head of Kazakh state oil firm KazMunaiGas announced that Kazakhstan would start filling the Odesa-Brody pipeline in the second half of that year and that a deal had been made with other members of the Tengizchevroil consortium that included ChevronTexaco, ExxonMobil, BP, and LUKoil to supply 6 million tons per year to the pipeline. The only matter that needed clarification was the price the Ukrainians would charge. "The Moscow Times" quoted the Kazakh official as saying that the interested Western companies were completing commercial negotiations with oil refineries in Southern Europe to receive their oil from Odesa-Brody and that initial agreements had been reached. But despite a decision by Ukraine's Cabinet of Ministers to send oil in the northerly direction, Ukrainian President Leonid Kuchma suddenly began agreeing with Russian oil majors that Russian oil should be put into the pipeline and pumped south. The TNK-BP lobbying effort was apparently making progress. On April 28, 2003, Interfax-Ukraine announced that Kuchma said at a press conference that "the shipment of Caspian oil via the Odesa-Brody pipeline is unlikely to take place because it would be a money-losing proposition, so Ukraine must reconsider the use of the pipeline for Russian oil shipments from Brody to Odesa." This view was rapidly seconded by Deputy Prime Minister for Fuel and Energy Andriy Klyuyev. Interfax quoted the Ukrainian president as saying that "the fact is that, as of today, there is neither a Caspian oil seller nor a buyer. 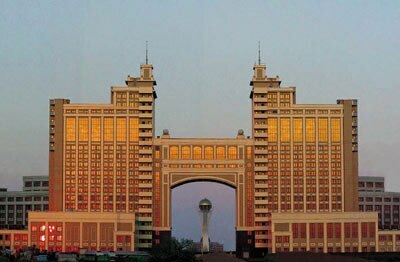 Visit Baku and speak to analysts and learn if there is Caspian oil. There is none and there will not be any. As for Russian oil, it exists, and we can earn $90 million in profits from the reversed use of the pipeline." The following day, U.S. Deputy Assistant Secretary of State for European and Eurasian Affairs Steven Pifer strongly contradicted Kuchma's statement and said that Ukraine had not done anything to insure Caspian supplies that could fill the Odesa-Brody pipeline. Pifer reminded the Ukrainian president that Germany and Slovenia both had refineries working with Caspian oil and that Ukraine was in an excellent position to utilize its pipeline to send Caspian oil to these refineries. Interfax-Ukraine, which reported Pifer's statement, also added that Pifer went on to say that if Ukraine wanted to integrate into Europe, "this is a wonderful way to unify its energy system with the European one." A pressing issue over the years was where Kazakh oil would be routed. The United States and Europe were placing their money into the construction of the $3 billion Baku-Tbilisi-Ceyhan (BTC) pipeline. This pipeline, when finished, would have a throughput capacity of 1 million barrels per day. 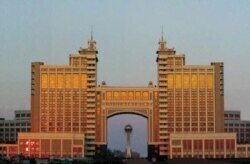 But for it to be commercially viable, it would need Kazakhstan to send its oil through it. A few weeks after the KazMunaiGas announcement, the Kazakh ambassador to Ukraine made an unexpected statement contradicting the head of his country's gas and oil monopoly. Speaking to reporters in Kyiv on May 19, 2003, Interfax-Ukraine quoted him as saying that Kazakhstan, in fact, did not have the required oil to fill Odesa-Brody. Why this rapid about-face took place was not explained. It is inconceivable that the Kazakh ambassador would make such a statement without the approval of Kazakh President Nursultan Nazarbaev and without the knowledge of KazMunaiGas. In effect, the revelation that there was no oil available for Odesa-Brody from Kazakhstan immensely strengthened TNK-BP's (and Kuchma's) hand and seemed to deal a serious blow to the effort to diversify Caspian oil-transit routes. In mid-June 2003, Russian Industry and Energy Minister Viktor Khristenko traveled to Kyiv, where he met with Serhiy Tulub, the Ukrainian minister for fuel and energy. A few days after this meeting, Khristenko sent a letter to Tulub explaining his government's position on the Odesa-Brody pipeline. According to Interfax on June 18, 2003, the Russian minister wrote that Russia was not interested in seeing Odesa-Brody flow in a northerly direction -- to Brody. Khristenko explained this by saying that there were no markets for Russian light oil in Northern Europe and that sending oil north to Brody would destabilize the markets in Southern Europe for Russian and Kazakh light oil. Khristenko said Russia was still interested in seeing the Odesa-Brody pipeline used in reverse mode, but at lower volumes than originally planned. In effect, he was telling the West that Odesa-Brody was off-limits. At the same time, Khrystenko noted that Russia was still interested in seeing the Odesa-Brody pipeline used in reverse mode, but at lower volumes than originally planned. In effect, Khristenko was telling the West that Odesa-Brody was off-limits to them. The argument that Russian light crude did not have a market in Northern Europe was somewhat exaggerated since most Russian crude is Urals blend. Khristenko also chose to speak on behalf of the Kazakh oil industry, which had already agreed to supply oil to fill the Odesa-Brody pipeline. Writing in "The Wall Street Journal Europe" on October 10, 2003, former Reagan-era national security adviser Robert McFarlane noted: "When Ukrainian Prime Minister Viktor Yanukovych was in Washington this week, certainly one issue for discussion was last week's decision by Ukraine's state pipeline company to move forward toward reversing the use of the Odesa-Brody oil pipeline in Russia's favor.... Russian oligarchic interests, however -- with Britain's BP unfortunately in tow -- wish to use that pipeline themselves, in the opposite direction.... This would cancel all the hopes that had been vested in the Ukrainian pipeline." 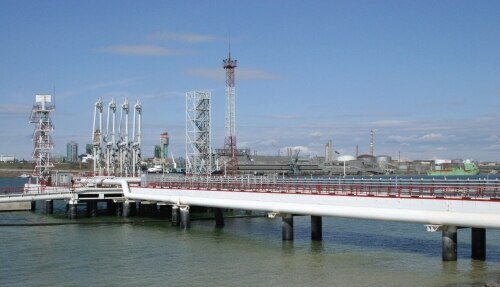 David O'Reilly, the head of ChevronTexaco, sent a letter to Kuchma on January 29, 2004, in which he wrote, "We are prepared to continue to work actively with UkrTransNafta and the other pipeline along the route to implement this project and make shipment through Odesa-Brody to Central Europe a reality." The letter has apparently gone unanswered. It was only in August 2005, with oil prices skyrocketing and Russian behavior becoming more aggressive, that the EU realized the value of Odesa-Brody as an alternative route for Caspian oil to reach Europe. The European Commission agreed to award a contract to a consortium of European companies to finalize the technical, economic, and legal studies required for the construction of the pipeline to the Polish refinery in Plock, Poland. The press release issued by the European Commission to Ukraine and Belarus on August 8, 2005, noted, "The construction of the Black Sea-Ukraine-Poland oil transportation corridor is a crucial infrastructure project in the context of EU and Ukrainian policies for security of oil supplies." According to the latest reports, little if anything has been done by this consortium of European companies to further the project to completion. MURKY CONNECTIONS. A year after the so-called gas war between Moscow and Kyiv, energy transhipments from Russia to Europe via Ukraine remain a concern. On December 1, RFE/RL's Washington office hosted a briefing featuring Tom Mayne, an energy researcher for the London-based Global Witness. Mayne discussed the lack of transparency in the energy sectors of Ukraine, Russia, and gas supplier Turkmenistan. RFE/RL's English-language coverage of Ukraine, Russia, and Turkmenistan.